Depression can rob people of their energy, their sleep, their concentration and their happiness. Because psychiatric medications are expensive and can have unpredictable and uncomfortable side effects, some people opt for natural methods like vitamin supplements. Vitamin C does relieve depression in some people and is also relatively safe and inexpensive. Be aware, though, that few people treat depression successfully with supplements alone and that suddenly withdrawing from psychiatric medications can be dangerous. According to Daniel Leger, M.D., one of the most common symptoms of scurvy is depression. Other symptoms are mood changes, fatigue and lethargy. Risk factors for scurvy, or a less severe vitamin C deficiency, are alcoholism or drug abuse, anorexia nervosa, Crohn's disease and celiac disease. People eating fad diets or who rely on fast food meals with few vegetables and fruits are also at risk. If you have any of these disorders and are feeling depressed, vitamin C supplementation may alleviate your depression. Even moderately low levels of vitamin C have been linked to depression. 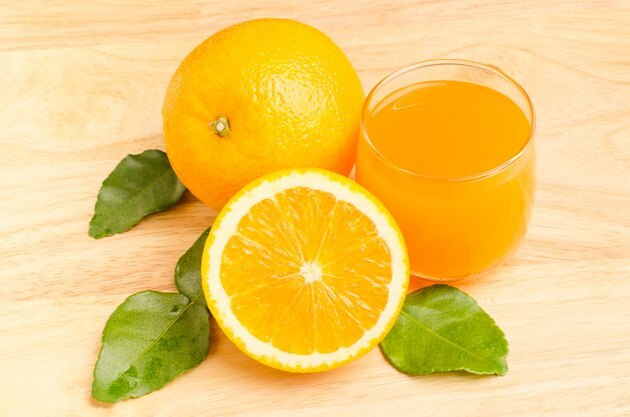 A study published in the January 2011 issue of the "American Journal of Geriatric Psychiatry" found that low levels of vitamin C were correlated with both depression and higher mortality rates. While correlation does not establish causality, these results suggest that it is prudent for older people to include more citrus fruits, lightly cooked green vegetables and salads in their diets. If they are unable or unwilling to cook, a supplement may be advisable. The link between vitamin C deficiency and depression may be caused by lower neurotransmitter levels. According to an August 2003 article in "Nutrition Journal," vitamin C works together with the enzyme dopamine-beta-hydroxylase to convert dopamine into norepinephrine, which plays an important role in the regulation of mood. Mark Riordan, M.D., a specialist in orthomolecular medicine, states that 30 percent of depressed patients who receive vitamin C supplements will improve. Since this rate of improvement is below the level produced by many placebos, many studies fail to find a significant effect for this treatment. Nevertheless, it may make an important difference for particular individuals, especially if they have low levels of this nutrient. If you are under stress, research published in the April 1998 issue of the "Journal of General Psychology" suggests that you may want to add vitamin-C-rich foods or supplements to your diet. Ethical guidelines preclude intentionally inflicting distress on humans, but animal models of depression show that animals subjected to unavoidable electric shocks had tissue levels of vitamin C that were between between 20 and 30 percent below unstressed animals. If you decide to take vitamin C, you may want to begin supplementing with between 75 and 90 mg of vitamin C per day, the amount recommended by Health Canada. Katherine Zeratsky, R.D., L.D., who writes for the Mayo Clinic website, recommends that the amount of Vitamin C obtained through supplements should never exceed 2000 mg. Amounts greater than this can produce diarrhea, nausea, insomnia and kidney stones. Remember, though, to consult your doctor if you want to experiment with large doses of vitamins or if the depression persists. Mayo Clinic; Nutrition and Healthy Eating: Is It Possible to Take Too Much Vitamin C? ; Katherine Zeratsky, R.D., L.D. What Vitamin & Mineral Deficiencies Cause Anxiety?